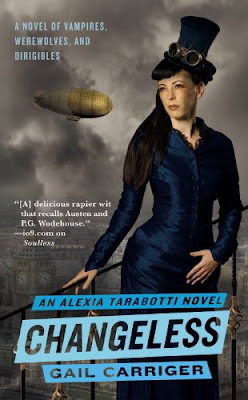 With Soulless by Gail Carriger just reaching the shelves, it appears Jessica at Book Reviews by Jess has already unearthed the cover for the next Alexia Tarabotti series novel Changeless. I came across Jessica's post via Janicu's Book Blog. The book releases March 30, 2010. And if you missed it from an earlier Urban Fantasy Weekend Report you may find the Soulless Victorian Dress-Up Doll created by Orbit Books of interest.The flash and illustration are by the very talented Sarah Vaughn. Alexia Maccon, now known as the Lady Maccon, awakens in the wee hours of the mid-afternoon to find her husband, who should be decently asleep like any normal werewolf, yelling at the top of his lungs. Then he disappears - leaving her to deal with a regiment of supernatural soldiers encamped on her doorstep, a plethora of exorcised ghosts, and an angry Queen Victoria. But Alexia is armed with her trusty parasol, the latest fashions, and an arsenal of biting civility. Even when her investigations take her into the backwater of ugly waistcoats and Scotland, she is prepared: resurrecting ghosts, exposing a French spy, and unearthing the mysteries of a stolen Egyptian mummy. I purchased SOULLESS today! I plan on reading it this month. I am so pleased that it is a series and can hang with the characters for a while. I really do have to pick up Soulless now. Awesome cover for this too! Vickie I hear you about sticking with the characters. Nothing worse than finding a wonderful new character and then no more . . .
Ladytink I love the period setting. Eleni I think this one is going to be very popular.